To guarantee that you'll have your best academic year yet, enroll in one-to-one tutoring in Auburn CA. Call The Tutoring Center, Auburn CA at (530) 878-5010 to request more information, or to schedule a free diagnostic assessment. The first tip may seem a bit odd, but it's incredibly important if you want to have the necessary brain power to actually pay attention in class and learn what you should be learning. That is, to make an effort to be a healthy student. This is because, being exhausted or starving isn't conducive to learning (in fact, it's quite the opposite). Eat well, sleep enough, and do some physical activities to ensure your mind will be ready to absorb and assimilate the information that will be handed to you in the classroom. It may be that your brain will wander, daydream, and focus on other thoughts when you should be listening to your teacher. If that's the case, you should take a few moments before class begins to get mentally ready for learning and working. To that end, try your best to free yourself from any negative perceptions that you may have about the class or your own abilities. Likewise, let go of other thoughts that may strip your attention away from what's happening in class. Needless to say, if you know you get distracted easily, your best bet to keep your focus in the classroom is to avoid the sources of your distraction at all costs. 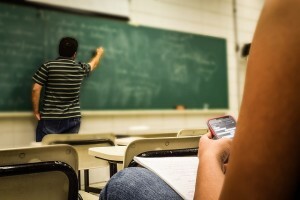 To that end, it is recommended that before you step into the classroom, you turn your cell phone off, as well as put away any magazines, books, games, or any other item that you can deem more interesting than what you should be studying. Something to keep in mind if you want to be an attentive student, is that where you sit can actually influence how successful you are in staying focused. This is because, sitting at the back of the classroom, close to your friends, or near windows and doors, can actually distract you tremendously. To avoid this, choose a seat near the front and center of the classroom, so you're more likely and eager to listen to what you're being taught. Call The Tutoring Center, Auburn CA at (530) 878-5010 to enroll in tutoring classes that will help you become a better student and learner. What would you think of a student who is slouching over and has their head leaning on the desk? Probably, that they weren't paying attention and that they may even be sleeping in the classroom, right? This means that your posture and position can actually play a role in how attentive you are in school. To help you stay awake, and become more receptive and focused, sit up and face your teacher. A great tip that won't only help you pay attention, but that will also help you prepare your study material for when tests roll around, is to write down notes during class. Doing so will require you to take in and assimilate the information your teacher is handing out, and then breaking down their ideas to write them down; all of which need of great levels of concentration. You should also give 'getting involved in class' a chance. Listening to what your peers have to say, as well as sharing your own doubts, opinions, and answers will help keep your attention in what's going on in the classroom. Moreover, it will allow you to have more enjoyable and enriching learning experiences, since you will be discussing important matters with your classmates and teacher. Last but not least, it's probable that there will be days when you will get distracted very easily (whether because you have a lot of things going on your mind, because you're sleepy, or other). In those cases, you should make a real effort to avoid distracting your peers and even your teacher. Remember that they're there to fulfill a responsibility, so don't derail their efforts if you can't keep up with yours. Call The Tutoring Center, Auburn CA at (530) 878-5010 to learn more about the benefits of enrolling in one-to-one tutoring in Auburn CA.